The Dorset Home for Girls was founded in around 1864 to train girls from the county for domestic service. The Home occupied premises at 32 West Street, Poole. The property, 'a large old-fashioned house... with a good garden attached', was purchased for the purpose by the Rev. Carr Glyn and leased by him to the trustees of the home at a nominal rent. It could accommodate about 30 girls. The Home site is shown on the 1902 map below. Dorset Home Industrial School for Girls site, Poole, c.1902. On February 29th, 1872, Home was certified to operate as an Industrial School, allowing its intake to include girls placed under detention by magistrates. As was usual in such establishments, the girls learned needlework and knitting, and did all the work of the house and the washing for the school. The matron in 1873 was Mrs Chappel, with Miss Goodchild as her assistant and schoolmistress. By 1877, Miss Ellen Saunders had taken over as matron, a position she was to hold until February 1898 when she was succeeded by Miss A. Cooke. A report in 1896 noted that the rooms in the School were numerous and generally small but that the dining hall was of a good size. A schoolroom had been added and the former covered playground beneath it had been converted into a comfortable playroom. A new laundry had also been built and there was a pleasant garden play at the back of the property from where views of the backwater of Poole Harbour could be obtained. 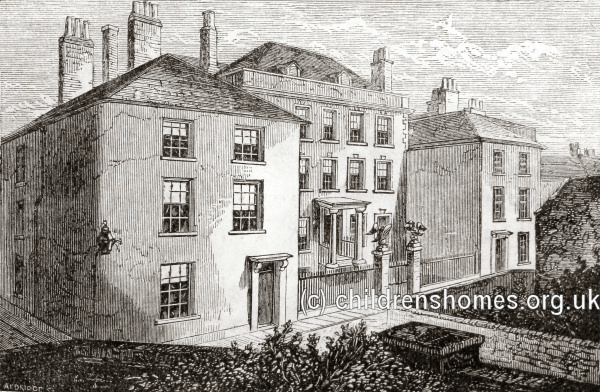 A house adjoining the School was being let to a carpenter employed by the School, and its upper rooms could be used for the sick or for old girls who had returned for a visit. This was perhaps the same property, at 30 West Street, that in 1916 was formally certified as an Auxiliary Home for the School — a halfway house for older girls who were leaving and taking up employment in the town. In December 1898, Miss Johnstone took over as matron from Miss Cooke. She was replaced by Miss S.D.C. Gabbett on March 20th, 1903, with Miss Boardman as house matron. The following year, Miss Gabbett was termed as the School's superintendent with the separate post of matron held by Miss Hammond. In 1906, Miss Read was appointed as kindergarten teacher. In 1910, Miss Boardman became matron of what was now referred to as the nursery school. In 1911, it was noted that the senior girls attended a cookery centre each week and that the attached nursery provided good training opportunities. Swedish drill was now being taken by a visiting instructress, and games were encouraged. There had been numerous outings and entertainments, and the school had won the challenge cup in the County Choral Society's competition. In 1923, the accommodation of the School was certified as being 75 places, including boys below the age of 8. The School ceased acting as an Industrial School in December, 1931. It continued in operation for a while as the Dorset Children's Home but appears to have closed by 1939. The slightly truncated building is now known as Jolliffe House. Former Dorset Children's Home, West Street, Poole.